Ride-sharing can only truly be efficient on road traffic congestion when strict criteria is applied to regulate its use to service travel demands. Jakarta’s three-in-one policy highlights these criteria which can be easily solved by GOVOIT. Jakarta is the second largest metropolitan area in the world, with some 30 million inhabitants, and is therefore one of the world’s most traffic congested cities. In 1992, the Indonesian Government introduced a three-in-one ride-sharing policy on the main streets of Jakarta’s central business district (CBD) with a dissuasive fine of Rp 500,000 for any infringement (15% of the average of the provincial minimum wage). The three-in-one policy bans all private cars with less than three people in them, from circulating in certain areas of the city between 7:00 am and 10:00 am; and from 4:30 pm to 7:00 pm. 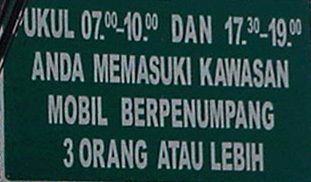 “Jockeys”, professional passengers which stood near the entry points of these three-in-one areas, circumvented these rules by offering themselves as additional passengers on a ride in exchange for around Rp 15,000 per additional passenger. Given these circumstances, the Indonesian Government decided to abandon the policy at the beginning of April 2016. Rema Hanna from Harvard University, Gabriel Kreindler and Benjamin A. Olken from Massachusetts Institute of Technology*, studied the effects of the elimination of the three-in-one policy on traffic speeds across the city. They collected real-time data before and after the elimination of the three-in-one policy, not only from roads affected by the three-in-one restrictions, but also on alternate unaffected routes. As expected, results showed a decline in average morning rush hour speeds from 28 to 19 km/hour in the morning and a decline in evening rush hour speeds from 21 to 11 km/hour (by way of reference, typical walking speeds are about 5 km/hour). Unsurprisingly, the increase in the traffic spillover led to alternative routes becoming affected, whereby the decrease in speeds impacted not only those roads previously governed by the three-in-one policy, but also other roads that had previously been unaffected. What lessons to learn for the future? Firstly, ride-sharing increases car speeds by dramatically reducing road traffic congestion. Secondly, enforcement is inefficient when the solution proposed can be subverted. Thirdly, ride-sharing requires all users to be tracked if it is to be efficient. The setbacks associated with ride-sharing can easily be resolved by way of using applications such as GOVOIT. GOVOIT can be used as a decision-making system to fine-tune departure times. GOVOIT can also be used during the course of a journey as a means of selecting route fluidity. Ride-sharing helps to reduce road traffic congestion by increasing the average car occupancy rate. However, ride-sharing can only truly be efficient when strict criteria is applied to regulate its use to service travel demands. GOVOIT is a multi-leg, ride-sharing application available on all smartphones, which allows users to travel door-to-door via a seamless connection, solving all the shortfalls of the three-in-one policy, which has now regrettably, been shelved by the Indonesian Government.